Des rabais exclusifs sur les activités de loisirs hiver et d'été, offerts par Powder House ski et de snowboard (7 emplacements pratiques à South Lake Tahoe); offre comprend 2 pour 1 des forfaits de location de ski pour la durée de votre séjour et / ou 2 pour 1 luxe Wintersteiger ski et planche tuning. Offre Ski Run Boat Company inclut une réduction de 25% de toutes les activités (bateau / jet ski / kayak / canot / bateau à aubes de vacances et parachute ascensionnel). *** Il n'y a que 11 marches jusqu'à ce que vous atteignez notre ascenseur; tandis que d'autres locations de la région ont entre 24 et 124 escaliers découverts à leur porte d'entrée (économiser votre énergie pour les pistes, et non pas les escaliers). Cet endroit est parfait et équipée avec tous vos besoins de cuisson dans la cuisine pour les draps. Besoin recommandations autour de la ville? Nous avons été les habitants Tahoe pendant plus de 38 ans. Great acesss to the slopes! Condo is comfortable and assess to the stagecoach lift was really close - just across the parking lot. Can't get any closer to Stagecoach Express! I can't say enough positive things about this condo and the owner, Kim. The location is amazing! The condo is literally across from the Stagecoach Express chairlift. It was such a short walk to the lift, and with all the snow, we were able to literally ski back to the condo! The condo itself is super comfortable and well-stocked! You can tell it's been updated, and everything was in great working order. The beds were really comfortable and the bedding felt high-end. There was a plentiful supply of toilet paper, paper towels, and pantry items. With the huge storm that hit, we couldn't get out to go to a store so it was great to have plenty on hand. Also, having the covered parking was a life-saver! We didn't have to dig out our car from the nearly 8 feet of snow that fell since our arrival. Plus, there's an elevator just a few steps up from the parking. Kim was very prompt in her responses and easy to work with. She is a gracious host and you can tell she values hospitality. Her condo is homey, super clean, and well stocked. Definitely designed for the comfort of her guests. We will definitely be booking this place again. I hope it's available for our Heavenly trip next year! Great location with all the amenities. Super convenient to the Stagecoach lift. Located right across the parking lot. Elevator makes it easy to move in and covered parking spots make it great for storms. My one request would be an upgrade on the Wi-Fi modem. Current one has limited bandwidth and tended to lock up. 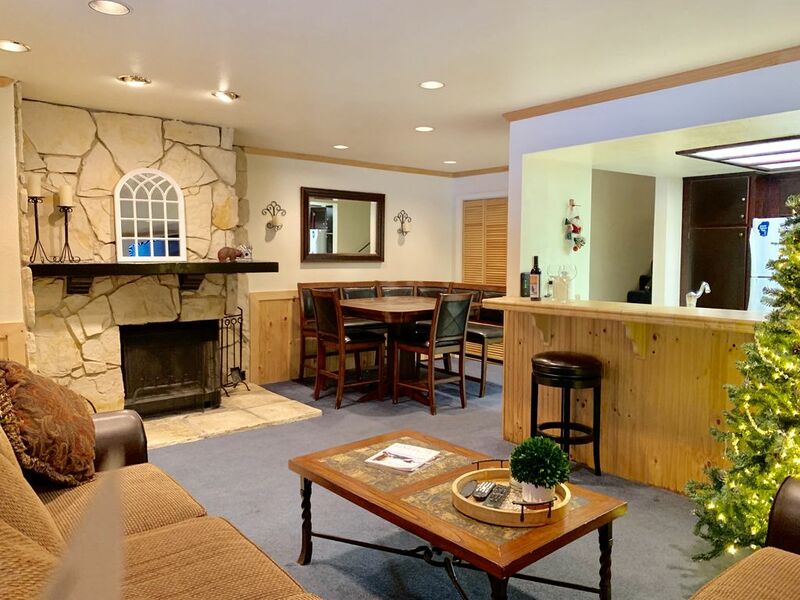 Overall, fantastic value and great ski condo. I’ve already rebooked for another stay this month. A little dated, but, overall a great condo. Unfortunately, our stay was during the many California fires. The views were obstructed most of the time, (of course nothing to do with the condo). Thank goodness there were two fans in the closet. Some of the worst heat experienced this year. The fans took the edge off of the extreme heat. Great bed, fabulous towels, kitchen was well stocked. Full size washer and dryer were very useful. Overall a great stay. Great place to stay, clean, comfortable and a quick Uber ride to the casinos. We attended a concert and had no problems getting a ride back. Hopefully we can book again this winter as the proximity to the ski lift is CRAZY close and the fire place after skiing would be perfect! Can't wait to return. No gas for grill.no a.c. unit. Plus the other unit on the floor .The person had a big dog and the owner let him pee right under our living room window.so each morning when the eastern sun would heat the carpet and it would smell right into our living room. So it made our place very uncomfortable be inside . There is a large common area but no personal deck. I'm sorry but I would not tell my friends about the place. The pool is only a short distance away. I would like half of my money back.